Short on holiday decor but have a lots of greenery? For a lot of the materials here, you won’t need to look much further than your backyard. 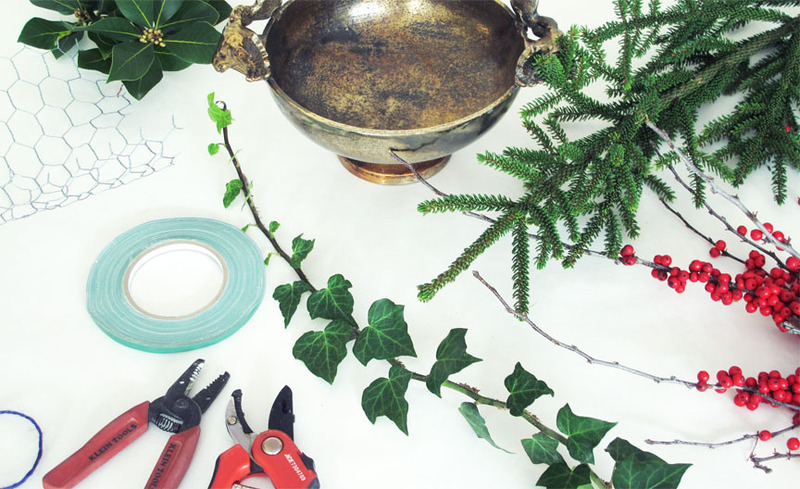 Follow these steps to turn your in season greenery into a holiday crowd pleaser. For more of these sort of tutorials and info on local workshops make sure you subscribe in the top right of the page! I picked up my greens from the Seattle Wholesale Grower’s Market– which to Seattleites, may as well be their backyard. They’ve got a wide variety of greens available that have all been grown locally. AND you don’t need a wholesale account to purchase on Fridays. It’s not important that you have the same greens, so long as you’ve got something in the same categories. Categories that I, ehem, have concocted after much experience, observation, and research…. Fluffy stuff: any foliage with a full, voluminous look, really a space filler but I don’t want to hurt its feelings. You’ll need 3-5 stems depending on the size of your dish. I am using an 8″ wide gold compote with elk heads! You can use all the same variety or multiple but I wouldn’t go more than 2. Here, I’m using some sort of Korean fir (or something), and Bay Leaf. Armature Stuff: This can or doesn’t have to be pretty, since we don’t use foam, it’s a functional component to ensure all this heavy foliage has a nice tight structure to keep it in place. An armature is a term used in sculpture to give shape and support to a piece. You can think of them as bones. For my armature I’m using about 3 twigs cut down into smaller twigs of red huckleberry. You could use any small branch or even cut offs ends of the rest of the foliage. Sprouty things: These can be graceful or spiky and are used in small quantities to give the arrangement a punch. It’s like a cherry on top. Too many sprouties and your arrangement can look muppet-like which is totally good in many instances but we’re going for something a little more traditional here. Here I’m using just one lovely ivy vine with a nice curvy shape to it, and one curvey branch of Pine. The ilex is the red berry, and while it is spikey, it’s acting more as an eye catcher. Eye-catchers: These are bold elements that stand contrast more than anything else. You will want to severely limit these. I’ve used Ilex berry for my eye-catchers and though one branch has several twiggies, they are clumped in the same spot so the eye-catching is still only happening in one place. Just one ilex shown here. Drapey stuff: Not always necessary but nice in this instance to cover the edge of the bowl. This is helpful especially to help camouflage my chicken wire cage. Drapey stuff is just that, something that is heavy enough to hang down or something with a graceful bend. I am using about 5 sprigs of cedar. floral tape, waterproof tape, or if your container has heads, you can use twine like me. Time: I’d give it 45 minutes once you’ve got all your materials if this is new to you. 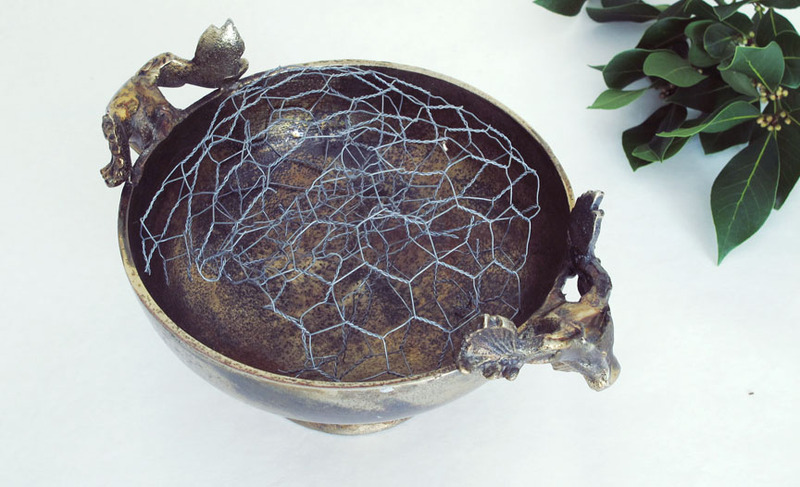 Make a chicken wire cage, or floral frog by bending your chicken wire into a bubble. Loop the sharp ends over the connection points so the wire doesn’t slip. Shape cage into container. Since this is a low dish, you will want to secure the cage in place from above. Typically I would use tape but since it can remove finishes, and I’ve got these great heads, I’m going to use twine. It’s not so important that the tape holds up during the entire process. It’s only there to get you started. As you go on, the stems themselves will hold everything up. It’s time to make an armature. As mentioned before, this is a crucial step to ensure your heavy arrangement is supported. Don’t think too much about what the arrangement will look like at this point. This part will likely disappear into the arrangement. It’s got more functional value than aesthetic. Clip or pull off any little twiglets that will interfere with inserting your twig into the cage. Remove twiglets and cut the bottom so that the stem end touches the bottom of the container, and the first twiglet ‘Y’ rests right inside the opening for the chicken wire. Remember, the point is to get a bunch of stems in place so your next step has a more secure support cage to be inserted into. More stems with less top growth are better than less stems with bushier top growth. So goodbye twiglets. We’re trying to jam up that base. 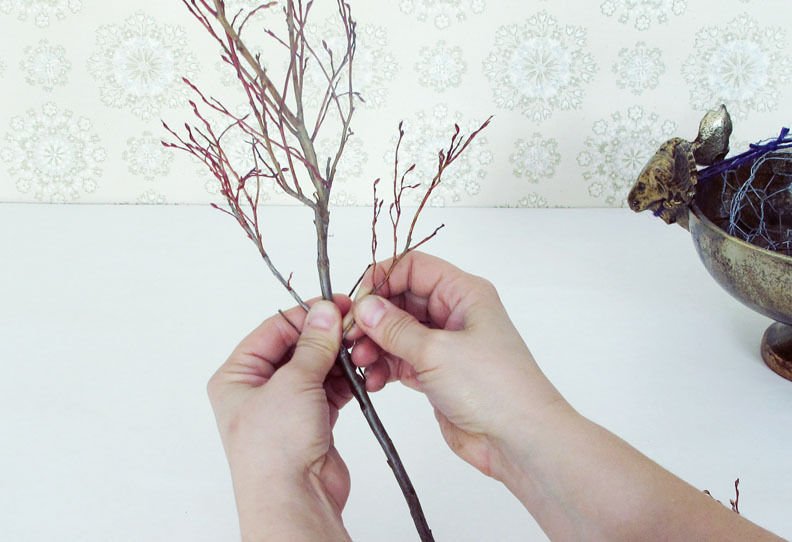 Go nuts with twigs. The friction of stem on container, and twig on twig will make your arrangement secure. We'll use the drapey stuff to cover the rim. Remove all the excess twiglets so what you are left with is clean and has its own clear shape. Cut the end and insert so the stem touches the bottom of the container. This is the part when I got really into singing Mariah Carey’s ‘All I want for Christmas’ and forgot that I was supposed to photograph the steps. Basically I am adding the fluffy stuff and playing with placement on the sprouty bits. I know where I want my eyecatcher to sit so I’m leaving that open. Tuck in the eye- catcher. I left a spot for a fluffy piece of bay branch, too. Finally my sprouty ivy is the cherry o top of this pile of twiggy goodness. Where you goin’ berry? Don’t you know it’s cold outside? Stay tuned for upcoming how to’s. Be sure to subscribe to learn about upcoming events and workshops around the Seattle, Eastside, and Puget Sound. Tag us on Instagram (@lola.curious) so we can see your holiday creations!